Cover of Muncha! Muncha! Muncha! was in the series has been done before by “wading through words,” by Natalie on January 20, called Muncha! Muncha! Muncha! by Candace Fleming, so you see, I can’t do that book. But that was the only one. All others have been in my series and I blogged about them . The book I’m presenting today will be a cool surprise because as you can tell from the title it’s not a hot one. If it weren’t for my series I would have waited till winter to review it but since I am doing a series and it’s the last one, well, stay cool and hang on. Ok? Got your coffee and donut? Lets start. Resources: Celebrate the joys of the season and friendship as Chaucer experiences his first snowball fights, sledding, skating, and all of the most exciting parts of winter. The winter setting provides a natural lead into discussions about the seasons and hibernation, but can be used year-round in units and displays on bears and animals, relationships and families. http://www.thepicnic-basket.com/2009/11/chaucers-first-winter-picture-book.html. “It would be a great companion read aloud with Karma Wilson’s Bear Stays Up, which provides rhyming text about a bear who tries to stay up for Christmas, despite how tired he is and how he wants to fall asleep.” Tina says on Picnic Basket. For lesson plans and teacher guides on what to do and read for all ages go to http://www.theteachersguide.com/Winterlessonplans.htm And go to http://www.docstoc.com/docs/68235228/January-Lesson-Plans for cutting out snow flakes and hanging from the ceiling. And weekly or daily plans on making a snowman out of cotton or painting one and adding mittens, scarf and hat. First Three Sentences: Chaucer was a curious young bear. He poked and Prodded wherever he pleased—under rocks, under water, even high in the trees. Chaucer’s best friends were Nugget and Kit.They were a little older than he was. 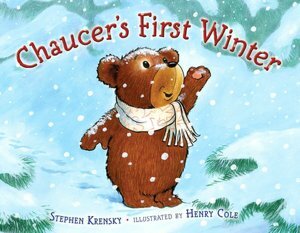 Review: Nugget tells Chaucer that soon he’ll be asleep as winter comes and that he’ll miss a lot. Well, Chaucer just doesn’t feel sleepy and enjoys all the wintery activities they do. Of The magic of snow, sledding and throwing snow balls, ice skating and more. Then a big blizzard comes and he watches with his friends. After that the days get a little longer and the sun gets stronger. Winter is over and his friends tell him a change is coming, that they can almost smell the flowers. Chaucer is sorry to see winter go. He visits his parents who are waking up from their long nap and wants desperately to tell them all about what they have missed. However, and yes, this is a spoiler, all that fun will just have to wait. What I thought: It seemed like Stephen Krensky couldn’t make up his mind whether it was going to be poem or not. I’d be reading along and two lines would rhyme and then the next one wouldn’t. Since my mind is on summer and the activities coming up I had a hard time keeping this book in mind since it had to do with winter. If it hadn’t been part of my series, I wouldn’t have done it. Especially the resources were hard to do. Once it gets on the list and is themed I don’t think that will matter. Thankfully. J Also as far as first author of Cheerios or Spoonfuls of Stories, this author has over one hundred of children’s books out according to the jacket. So he’s not even close to being a first author. For the complete list of books with resources, please visit Perfect Picture Books..
And for an interview of me check out Linda Weaver Clark’s blog. If you comment you may win an E book copy of Annie’s Special Day. The contest runs from June 11, 2012 to June 18th ,2012. Friday is the fifteenth so there will still be three days of the contest left. Maybe you’ll take a look. 🙂 🙂 I was still Clarike when that interview was taken so you know Linda waited for publication awhile before posting it. Linda also put the cover up at her writing site. As you can see it is the old cover. I was sure we’d have a print book by now way back when I told her to post this. However when we got the proof back from the printers last week it needed a whole other smaller size. We, meaning my husband and I, are learning so much about the business of publishing a children’s book we could almost self publish this one by now. What are all of you going to do now that this is the last Perfect Picture Book Friday? Are you going to keep blogging about picture books or talk about how your summer is going? This entry was posted in blogging, Clara Bowman-Jahn, Clarike Bowman-Jahn, Course or Book Review, Perfect Picture Book Friday, social networking and tagged Chaucer's First Winter, Cheerios, Perfect Picture Book Friday, Picture book, Simon & Schuster, Susaan Leonard Hill. Bookmark the permalink. Chaucer’s First Winter sounds cute, and there’s nothing wrong with a little cool reminder in the hot summer 🙂 This will be a fun one to add to the list! This book looks really cute and, well, REALLY cute! 😉 I really like Chaucer’s friends’ names! 🙂 I love the book Muncha! Muncha! Muncha! a lot. This is a lovely book Clar and fits perfectly with my season down here…. yes, have you forgotten, a friend is sitting infront of her heater, it’s winter here now…lol. I loved the book it’s cute. Talk soon. I thought for sure this was a middle English historical tale. Imagine my surprise when I saw the image of the adorable bear in the snow. 🙂 This looks like a fun read, Clar! It is so hot here, I am thankful for a book about snow. I can dream about cooler days, right? Thanks, Clar for the recommendation! Where are you, Amy, that it’s so hot already. Kids books aren’t my thing, but I’m loving reading about them here and it’s great to know that there’s such a wonderful collection of them out there for kids to read. Loved your Cheerios selection. This one was especially fun and a great book for kids! LoL. Yes, I thought so, too. A nice cool book to return to on those dreadfully hot days that are coming! Thank you! Well done and appreciated! Thanks for a good read. I love the names in this story! The title peeks your interest immediately! This has been a great series! Thank you for sharing the Cheerios books, I’ve enjoyed learning more about them. I think a winter book review in the summer is a marvelous idea. (It was 113 degrees today at our house, so I’m all for a little cool-down!) My kiddos are beyond picture books now, which does make me a little sad. I went to Linda’s blog and read the lovely review and interview….Congrats, Clar…your new book sounds delightful!